Yes, most car donations are accepted, running or not (exceptions include older cars whose value would not offset the cost of towing). To find out if we can accept your car donation, please call 1.877.KARS4KIDS®1.877.KARS4KIDS®, or fill out the online car donation form. We accept cars in any condition. Will my car be recycled? Yes, your car will be sold at auction to buyers or recyclers for parts and metals. If someone passed away can the car still be donated? We can pick up the car as long as you have a copy of the death certificate and documentation that you are the official inheritor of the deceased’s belongings. What happens if there's a problem with my car after it's donated? You are responsible for the car until it is picked up. You are liable for all previous storage charges and previous fines. Once the car has been picked up we take full responsibility. No. There is absolutely no charge. Who will pick up my car donation? Kars4kids has a network of professionally licensed, bonded and insured towing agencies in the provinces of Ontario and Quebec that pick up car donations. You will be contacted to arrange a time of pickup that is convenient for you, free of charge. We accept car donations in Ontario, primarily in the Toronto metro area and its environs, and in Quebec, primarily in the Montreal and Quebec City metro areas. How long will it take till my car is picked up? The average pickup time for car donations is usually 24-72 hours from your initial contact with us. Do I have to be home when you pick up my car? No! Just clean the car of any personal belongings and leave the keys and ownership document under the dashboard. What do I need to know about signing my ownership document? 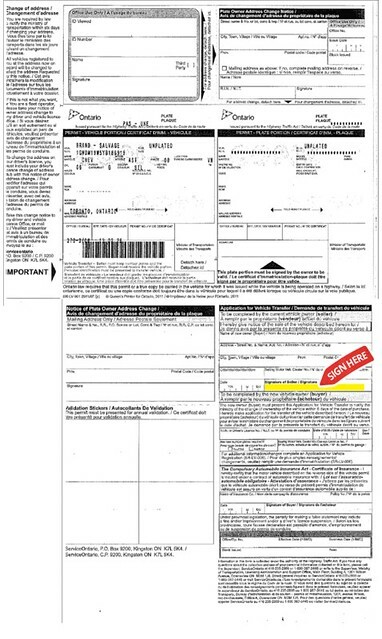 When signing your ownership document, please make certain that you sign your name as the "Seller" in the Application for Vehicle Transfer section EXACTLY the way it appears on the face of the ownership document. Click here to view a sample Ontario ownership document, or here for a sample Quebec ownership. What if I don't have my ownership document? We can almost always pick up your car donations without an ownership document. Call us at 1.877.Kars.4.kids® (877.527.7454)1.877.Kars.4.Kids to see whether we can pick up your car. We will, however, require another form of ownership, such as the registration at the time of pickup. We will contact you after the pickup with additional paperwork to order a duplicate ownership document from the MTO or the SAAQ. Remove license plate before your car is picked up. In Ontario, they can be attached to another vehicle. Make sure to register the change with the MTO. If your plates are not yet up for renewal, you can turn them in to the MTO for a refund. In Quebec, the plates can be removed from the vehicle at the time of pick up and turned into the SAAQ. Will I receive a tax credit for my used car? Kars4Kids is a registered charitable organization. We will issue you a receipt with the fair market value of your vehicle, as determine by wholesale auction averages. You will receive the receipt approximately 4 weeks after we pick up your car.